Psychological Medicine Research team (left to right): Dr. David Okai, Dr. Ian Baker, Dr. Helen Griffiths, Dr. Isabel Paz, Dr. Jane Walker, Dr. Karen Steinhardt, Dr. Mark Toynbee. Professor John Geddes, Head of Department, says, "I'm delighted that our esteemed colleagues have been recognised for their unyielding work and contributions to the research, development and progress of mental health. At the Department of Psychiatry we strive to promote excellence in clinical practice, to develop and provide innovative clinical services. Our world class research could not be achieved without the true collaboration of our colleagues and partner organisations focussed on equality and quality for mental health services." 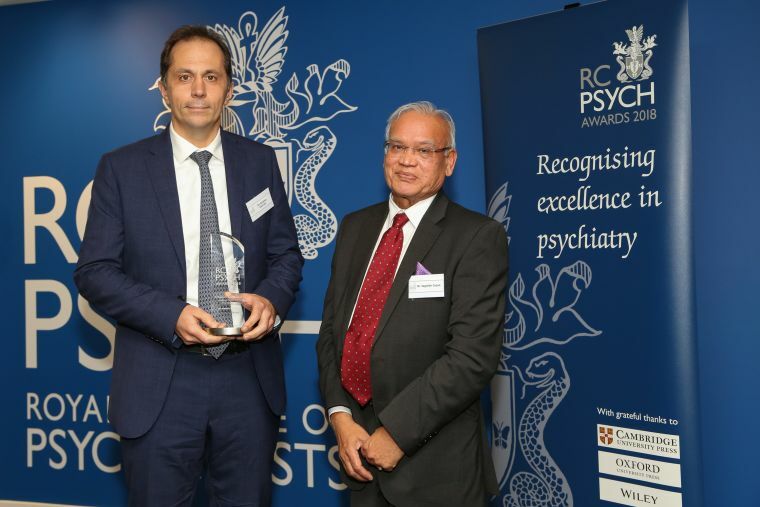 The annual Royal College of Psychiatrists (RCPsych) Awards mark the highest level of achievement within the field of psychiatry. This year, the awards were presented by Victoria Derbyshire at an event in London on 7 November. Professor Andrea Cipriani, said, "I am honoured to have won this award and I feel privileged that I'm working in Oxford, a vibrant environment with fantastic colleagues in the University Department and in the Trust. I'm very pleased to have my work recognised. In collaboration with international experts, we are using high-quality data to develop a web-based algorithm to personalise treatment in mental health. This is the way to go to better inform the real world decision-making process between clinicians, patients and carers." Professor Andrea Cipriani and Dr J Jajoo. Professor Michael Sharpe, of the Department of Psychiatry and Trust Lead for Psychological Medicine in Oxford University Hospitals Trust, said, "The team is a great example of what can be achieved by good University and NHS collaboration. The team deliver innovative clinical services, cutting-edge research and high quality teaching. I am proud of all my NHS and University colleagues who work together to make patient care as good as they possibly can." Dame Fiona Caldicott, Chairman of Oxford University Hospitals NHS Foundation Trust won the prestigious Lifetime Achievement Award. Dame Fiona Caldicott was Principal of Somerville College in the University of Oxford from 1996-2010, and a Pro-Vice-Chancellor from 2002-10.